Classes designed to nourish, replenish, open the heart, open the mind! Peace. Shanti. Bliss. Ananda. Community. Sangha. Yoga. Yogaha. Om. Aum. (Complimentary mats, blocks, straps all for your use!) Class cost is $150mxn/$8USD - You do not need to pre-register for any of our classes. All classes in April will be led by Meg (E-RYT 500 Yoga Alliance Instructor). Meg holds certification in Holistic Himalayan Yoga, Vinyasa, Ashtanga (from Manju Jois ~ son of the founder of Ashtanga Yoga), Meditation, Theory (from Kaivalyadhama Institute), Anatomy (Leslie Kaminoff) and Sound Healing. 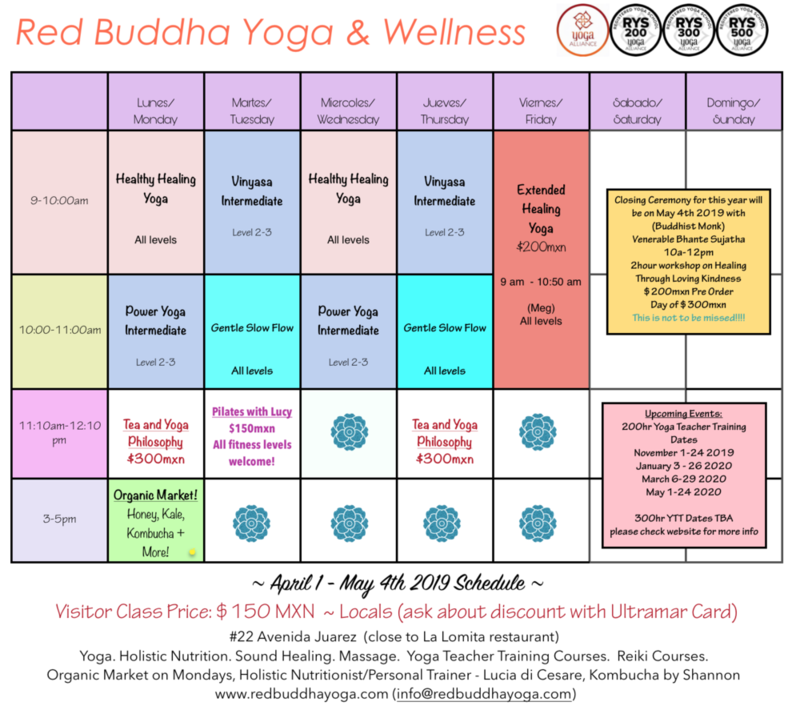 She is a E-RYT 500 and Founder/Director of a 200hr, 300hr and 500hr RYS (Registered Yoga School), the first school ever to be registered on the island of Isla Mujeres in Mexico with Yoga Alliance. She attributes learning the most from her time with ~Kino Macgregor (Ashtanga Yoga), Edwin F. Bryant PhD (former Harvard & Colombia professor, one of the leading Indologists in the world), Sharath Jois (grandson of Shri K. Pattabhi Jois), Manju Jois (son), Tim Miller (Ashtangi). *Feel Free to stop by our front desk for a printed schedule. Marine our receptionist can help you with a schedule from 8:30am-2pm Monday through Friday. # 22 Avenida Juarez Behind Bahia Hotel. 50 meters from ferry dock, near restaurant La Lomita. Gentle flow that feels like a full body massage. Meg has worked on developing this technique for 14 years. It targets the Immune and digestive systems most. Activates the para-sympathetic nervous system that reduces stress. Balance your hormones, improve your flexibility, strength and concentration. Ancient techniques from Northern India.. Balancing Sthira (steady and alert) and Sukha (comfortable and light) as you move into more Intermediate - Advanced posture work. Asana work based on the teachings of Sri Pattabhi Jois. Flow and static postures.